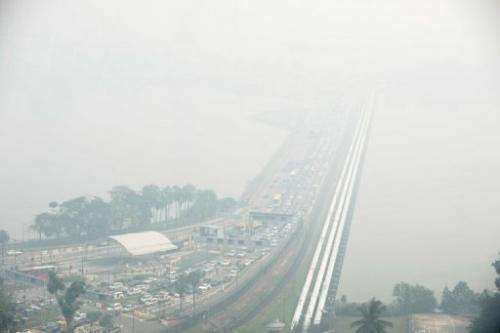 A general view of the causeway from Singapore to Johor Bahru (background), obscured by thick haze, on June 21, 2013. Singapore's smog index hit the critical 400 level, making it potentially life-threatening to the ill and elderly people, according to a government monitoring site. Indonesia on Friday deployed helicopters to artificially create rain in a bid to fight raging fires that have choked Singapore with smog, which is hitting record-breaking levels that pose a threat to the elderly and the ill.
At a late-night emergency meeting, President Susilo Bambang Yudhoyono ordered disaster officials to "immediately mobilise all the country's resources" to extinguish the fires on Sumatra island that have created vast palls of smoke. Singapore's worst environmental crisis in more than a decade has seen the acrid smoke creep into people's flats and cloak residential blocks as well as downtown skyscrapers, and the island's prime minister has warned it could last weeks. 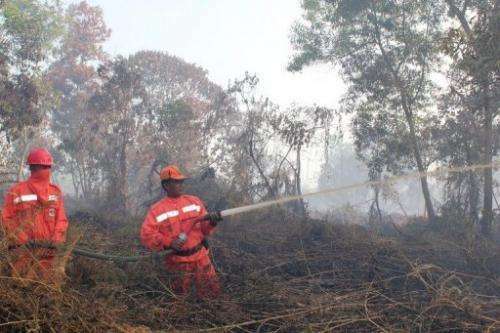 Indonesia's national disaster agency said that two helicopters with cloud-seeding equipment were sent early Friday from Jakarta and Borneo island to Riau province, where hundreds of hectares (acres) of carbon-rich peatland are ablaze. "Hopefully, we will be able to create artificial rain today," said agency spokesman Sutopo Purwo Nugroho. He also said water-bombing helicopters could be dispatched, although gave no timeframe. Firefighters on the ground have struggled to put out the blazes, which are burning under the surface of the peat. Firefighters tackling blazes in Bengkalis district, the worst hit area, were "overwhelmed" and unable to cope, Ahmad Saerozi, the head of the natural resources conservation agency in the province, told AFP. Graphic showing areas hit by haze from forest fires on Indonesia's Sumatra Island and Singapore's Pollutant Standards Index readings, which reached the critical 400 level on Friday. "We have been fighting fires 24 hours a day for two weeks," he said, adding that aircraft must "drop water as soon as possible. We can't do this alone". As Indonesia stepped up its fire-fighting efforts, Singapore's smog index hit the critical 400 level, making it potentially life-threatening to the ill and elderly people, according to a government monitoring site. The all-time record level was reached at 11:00 am (0300 GMT) on Friday after a rapid rise in the Pollutant Standards Index (PSI). It fell back to 360 in the afternoon. According to Singapore government guidelines, sustained PSI average levels above 400 on a 24-hour basis "may be life-threatening to ill and elderly persons". Before the latest crisis which erupted on Monday, the previous Singapore air pollutant index high was 226, recorded in September 1997. That episode cost the Southeast Asian region billions of dollars and also resulted from vast amounts of haze from Indonesia, where slash-and-burn farming generates heavy smoke during the dry season that begins in June. Indonesian firefighters from the Forest Ministry battle forest fires in Pekanbaru city, capital of Riau province, on Sumatra island, and about 320 km west of Singapore, on June 20, 2013. Indonesia on Friday dispatched helicopters to create artificial rain in a desperate bid to fight raging fires that have choked Singapore, as smog cloaking the city-state hit record-breaking levels. 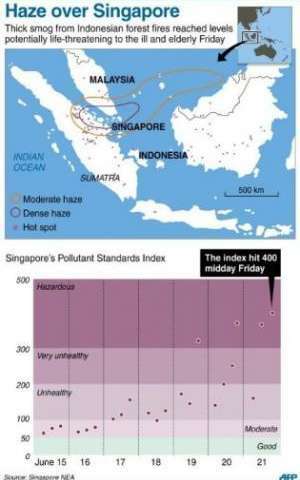 Parts of Malaysia close to Singapore have also been severely affected by the smog this week. 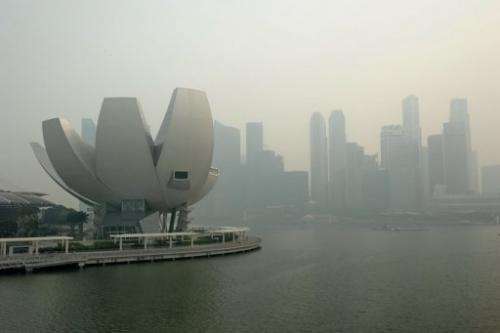 The haze crisis has had a dramatic impact on life in Singapore, with the city-state's residents scaling back their activities in a bid to protect themselves. Fast-food deliveries have been cancelled, the army has suspended field training and even Singapore's top marathon runner has been forced to run indoors. Hunched commuters are wearing masks or cover their mouths as they travel to and from home, with major drug stores telling AFP they have temporarily run out of masks and cannot accept advance orders. Vivian Balakrishnan, Singapore's minister for the environment and water resources, who has demanded "definitive action" from Indonesia to stop the haze, was due to meet his Indonesian counterpart in Jakarta later Friday. A general view shows Singapore skyline, shrouded by haze, on June 20, 2013. Local smog index hit the critical 400 level on Friday, making it potentially life-threatening to the ill and elderly people, according to a government monitoring site. The haze crisis has caused tensions to escalate dramatically between tiny Singapore and its vast neighbour, with the city-state repeatedly demanding that Jakarta step up its efforts to put out the fires. However, Indonesian officials have become irate at the demands, and on Thursday the minister coordinating Jakarta's response to the crisis accused Singapore of acting "like a child".